Drawing 135 has two designs for an entrance hall. The left-hand side of the drawing shows a square-plan hall measuring 24 by 24 feet and forming a link, as in drawings 133 and 134, between the porte-cochère and the front door of the existing house. The hall is covered with a pendentive dome supported at four corners by fluted Doric columns. The design establishes a series of segmental arched entrances through which the visitor may pass. 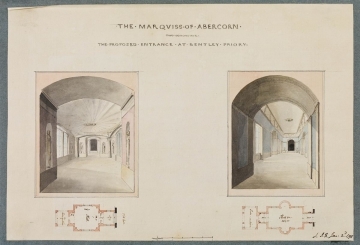 The right-hand side of the drawing has a rectangular-plan hall with projecting apsidal alcoves on two sides and arched entrances at the ends. The room has a flat ceiling with coved edges decorated in festoons.